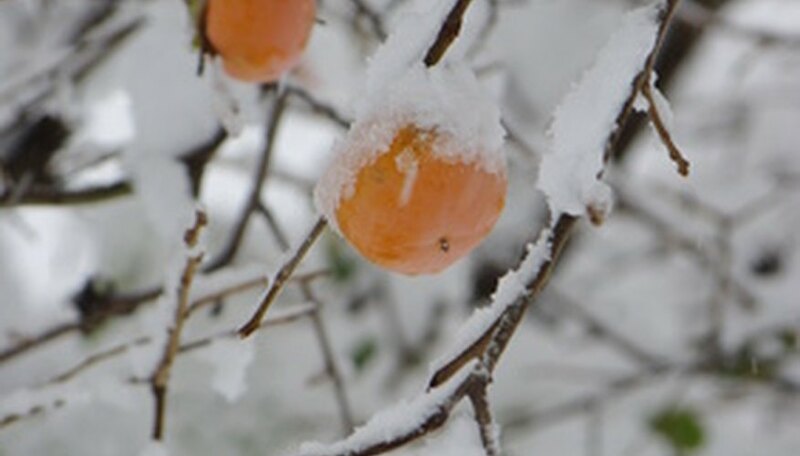 Persimmon trees are known for their sweet and spicy fruits that are bright-orange or red and can remain on the trees well after the leaves have dropped. The fruits are high in vitamin C and iron. You need to select the right cultivated variety of persimmon trees that are hardy for USDA zone 5. Asian persimmon trees are hardy down to only zone 6 or 7, but most cultivars of the American persimmon (Diospyros virginiana) can grow in zone 5. Plant your persimmon trees in spring or fall. Plant the tree in a site that is in full to partial sunlight and any soil type, but preferably well-draining soil. Choose a location that can accommodate the persimmon tree’s mature size of 30 to 50 feet in height with a 20-to-35-foot spread. Dig a planting hole that is the same depth and three times the width of the persimmon tree’s root ball. Set the root ball into the planting hole and refill the hole with the displaced soil. Water the ground around the newly-planted persimmon tree thoroughly, to soak the soil down to and around the root ball. Allow the water to drain into the soil to help eliminate any air pockets around the roots. Spread a 2-to-3-inch layer of organic mulch on the ground around the persimmon tree. Spread the mulch in a 2-foot-diameter circle around the base of the tree to control weeds and preserve soil moisture. Water your persimmon tree deeply and thoroughly once or twice each week during the first year. Soak the soil around the root area, watering during each week when rainfall is less than 1 inch. Feed your persimmon tree once each year in early spring with a slow-release 10-10-10 NPK or other complete, balanced tree fertilizer. Follow the dosage instructions on the fertilizer label. Prune the persimmon tree in late winter to remove any suckers growing from the base of the tree. During the first two or three years, prune the persimmon tree to establish six to eight lateral scaffold branches that are evenly spaced along either side of the trunk, pruning away all other lateral growth. You will need to plant at least one male and one female persimmon to ensure cross-pollination and fruit production. Harvest the American persimmon fruits when they begin to fall from the tree and are easily pulled from the branches. Watch out for birds, raccoons and opossums stealing your persimmon fruits. To prevent wildlife from eating the fruits, harvest the fruits when they have achieved the mature color but are still hard. Place the fruits into a paper bag with a ripe banana to help them to ripen indoors.